The Cairnryan to Belfast route is a fast and comfortable crossing to get to Northern Ireland. Belfast is the capital of Northern Ireland, and offers its visitors a whole host of attractions; from the Titanic museum, the Belfast Zoo and its beautiful cathedral. 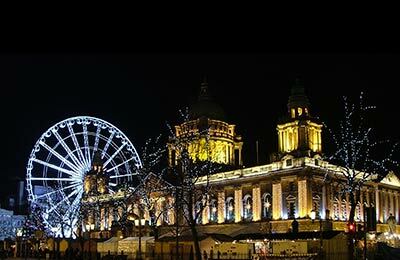 Belfast is also a great starting point to exploring the rest of Northern Ireland. 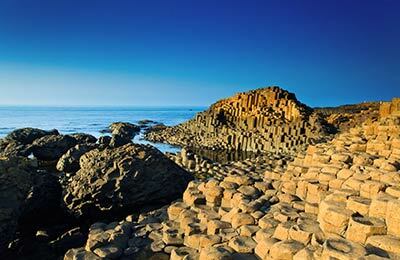 The Giant's Causeway is a stunning World Heritage Site offering picture perfect sites. More recently Northern Ireland has become popular with Game of Thrones fans, where tours of locations used in the series can be visited. Stena Line operate the Cairnryan Belfast ferry route, with journey times of just 2 hours and 15 minutes. You will sail on either the Stena Superfast VIII or the Stena Superfast VII. Both ferries offer free WiFi, free movies and the ability to upgrade to the Stena Plus lounge and Superfast Suites which offer a more relaxing and private atmosphere to your journey. See below for the latest Cairnryan to Belfast timetable and lowest prices. To get a quote for your requirements use the search engine. With AFerry we always give you our best prices for ferries from Cairnryan to Belfast. No matter which page you book from we always include all our special offers. And there is no need to look for a discount code. If we have an offer available, your ferry price will include the reduction or offer. There's no need to look at other websites. If you're not sure if the Cairnryan to Belfast route is right for you or you can't decide between ferry companies, if there is more than one, you might also find it useful to read any reviews we have available. We ask all our customers to send us reviews for Cairnryan to Belfast ferries. Remember though, that the earlier you book, the cheaper prices normally are. So don't spend too long deciding! Cairnryan to Belfast is a popular route, so we advise you to book as soon as possible. Staff move around the decks at speed... their obviously busy but do they have to just let doors slam behind them. It adds to a stressful experience. The movie offerings are dismal... cartoons! What about adults travelling... we need a break whilst travelling which a half-decent movie would provide.